So, for anyone who knew me before I met Chris, choosing a spouse for me would have never involved qualities such as outdoorsy or adventurous. But, because God has a sense of humor, the mate he created for me is both of these things and so much more. Chris is an amazing man who is completely well-rounded. I like to refer to him as "the bridge." Reason being: if you put two completely opposite people into a room and then add him to the mix, he will find some common ground to bridge the gap. For this reason, I completely adore him. He also knows just enough about almost everything to be able to have a conversation with just about anyone. I thank his car sales days for that skill. A friend of ours said it best when she said, "Chris is kind of like Charlie from the Farm Bureau commercials." And she is exactly right. His knowledge of so many subject matters, his hunger to learn more, and his incredible conversation skills drew me in from the beginning. I love that he knows so much and that he is so fun to talk to. I love that he can fix anything and that if you have a problem, he will do his best to find a solution. I love that he mows my parents' yard because my dad is allergic to grass. I love that he installed a ceiling fan for a friend at work in her new house. I love that he installed the wood floors in our house and learned how just by reading a book. And I love that if a person is need of zip ties or a screwdriver, chances are he has them in his backpack or just outside in his truck. I am completely in love with and totally fascinated by this multi-faceted and well-rounded composition that is my husband. 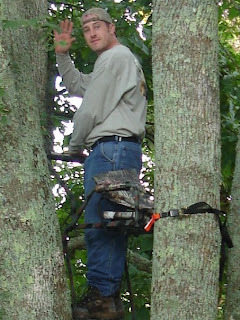 For anyone who does not know, Chris is an avid hunter, and has been for most of his life. This is one hobby that I do not understand and have never really been exposed to before. All I know is that toward the end of September his focus completely changes and life revolves around hunting (and Fantasy Football). I know he loves it, and I do understand it a little more after almost 5 years together. I know he loves being outdoors, and the beauty of the woods totally fascinates him. There seems to be something peaceful to him about the solitude and the silence. I also know that the thrill of the hunt is exciting to him. This part I don't understand as much, but I know it makes him happy. Like I said before, I really don't understand all of it, and in the past, I have not been very understanding about it. I know I have thrown a few fits about him leaving and I know I have cried many times during those fuzzy, about-to-lose-service phone calls. I know this has not been easy on him, and I know I have been manipulative and hurtful. Last year I was pregnant so I had an excuse to be weepy and demand that he limit his travels and not leave the county after December 1st. But the years prior and this year, I have no excuse. So this year, I am trying my absolute hardest to be more understanding and nicer about the whole thing. I know it makes him happy, and I know that in the grand scheme of life, the days he spends in the woods are far outweighed by the days he spends being wonderful to me. Now, I am not saying that I will be the saintly wife who never speaks my mind, but I am sure going to try to be patient and understanding when he needs to leave town for a couple of days. I am going to try not to throw fits and cry every time he calls. I am going to try to help him pack for his trips and I am going to try to send him off with a kiss and smile instead of tears. I am going to try to do all of these things for three reasons. Reason number one: Seeing my husband smile. There is nothing more satisfying to me than knowing that Chris is happy, and if I can do anything to help him be happy, I am going to do it. Reason number two: the little blue-eyed girl asleep in the other room. I want to be an example to her. I want to show her what a loving and understanding marriage should be, and I want her to understand that part of a marriage is compromise and wanting to make the other happy. Reason number three: bettering myself. I want to be a better person. I want to be a supportive, loving wife. I want to understand my husband, and I want him know how much I love him. I guess becoming a mommy forces your identity to change. I guess after 29 years, it's time for me to grow up a little and work a little harder for the people I love.